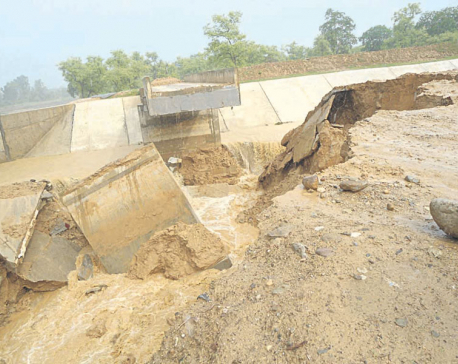 Arjun Oli/Republica A broken section of the Sikta Irrigation Project near Dhakeri village, Banke on Tuesday. NEPALGUNJ, July 25: The main canal of the multi-billion rupees Sikta Irrigation Project has broken down again on Monday night. The project, which is one of the high priority projects of the government, broke down while undergoing quality check. The main west canal broke down near Changai khola. 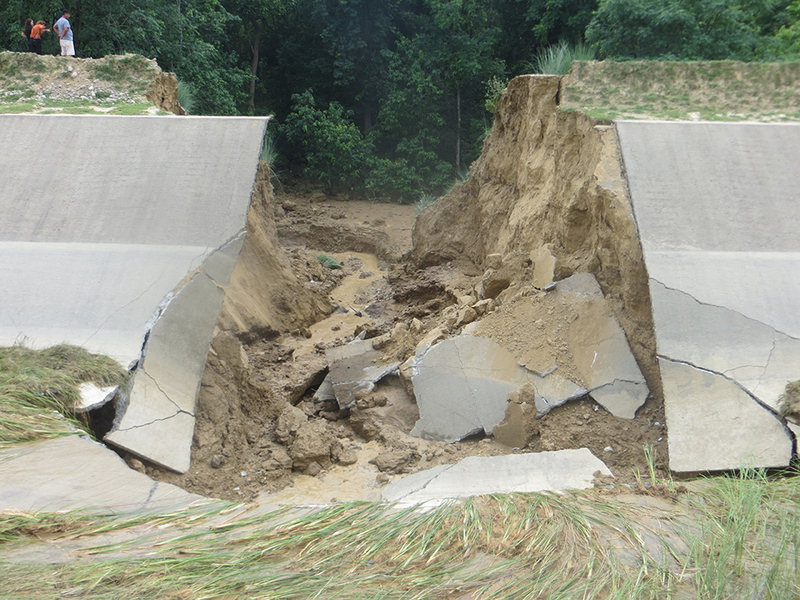 The damaged section stretches along ward number eight and nine of Raptisonari Rural Municipality. Residents in the area have been alarmed after the news of canal's break down spread across the settlements. "We were not able to sleep through the night after we came to know that the main canal has broken down. Though there has been no flooding in our area, it is not definitely a time to be relaxed," said Dhaniram Khatri, a resident of Dhakeri village. "The incident has put all the settlements around the canal under risk of floods," he added. Dhakeri village is around a kilometer away from the damaged section of the canal. "If our village was near the canal, our village would have been flooded and there could have been loss of life and property," Khatri said. The main canal is supposed to hold 50 cumec of water. However, it broke down while the authorities were testing its capacity by releasing only 4 cumec of water. Prior to this, the canal had broken down in June, 2016 near Jhijhari river during a test run. At the time, the authority had claimed that it had broken down due to excess release of water in the canal. "They have constructed the canal, but it keeps on breaking. Such things happen when you don't do quality work. They have used substandard construction materials to build the canal and that is why it is breaking again and again," Khatri lamented. Locals accused authorities concerned for not monitoring the construction of the canal. "Such poor quality projects are bound to be constructed, when the authority concerned does not monitor. Usages of substandard construction materials and methods only adds to the rise in construction costs and adds to our suffering," he added. 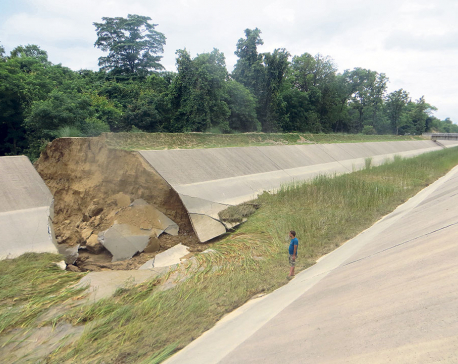 The damaged section falls in an area of the canal, which is around 17 Km long, where dispersive soil is used. The project's office informed that the section is still operating under maintenance period and is yet to be handed over to it. Locals, however, accuse that the canal was constructed over using low quality soil, which easily gets mixed up with water and therefore cannot withhold the water flow. "We are eyewitnesses. We saw that the contractor had used huge pile of soil to construct the canal. The canal is weak because of the poor quality construction material used in it," Khatri said. Along with the contractor, Oli blamed past governments for not monitoring the construction of the project and holding the contractor accountable for any use of substandard construction materials. "They should have tested the construction materials and the way it was being built back then. If they had monitored while it was constructed, the canal would not have broken now," he said. Oli also accused the contractor of constructing the canal using a sloppy design. "I was surprised to see the quality of the iron rods used in constructing the canal. We don't use such low quality iron rods even for building a small house," he said. "I don't understand how they passed this design in the first hand," he added. He also mentioned that the locals had objected to the use of dispersible soil when they first noticed it first. However, they claim that the construction went ahead as the authorities concerned did not share their concerns. "Locals were not blind. They were seeing everything. They had gathered to stop the contractor from using the soil. However, their voices were not heard. Had the project officials listened to locals, the canal would not have been so fragile," he said. When the canal had broken down two years ago, locals had pressurized the project authority to use better construction materials. They had strongly objected to the use of dispersible soil in particular. To assuage their concerns, the government had then formed committee to examine the case. "The government formed a committee. But the irony of it was that the committee was comprised of people who were directly or indirectly involved in the construction of the project. And as such the report prepared by the committee was not even made public," Oli said. It is not the first time Kalika Construction has come under controversy. Dozens of major projects being handled by it have drawn similar concerns. However, this contractor has been receiving one after the other mega projects, Oli claimed. According to locals, nexus between politicians and construction companies has led to the sorry situation. "When both the government officials and the contractor are interested in only making money through such projects, how would they give quality work?" Khatri fumed. The irrigation project had kicked off in 2004. So far, it has cost the government over Rs 14 billion with only 60 percent of the work complete.